I have always believed in *Gods Angels* and at the tender age of ten, I knew for sure, as God sent one to rescue me, from what I found out later, could have been the end of my life. Every once in awhile I got to go visit relatives who lived on a farm. I loved just about everything about those visits. My aunt would take me picking berries in the woods and tell me stories about my grandpa and grandma that I loved so dearly. I loved the farm animals and the freedom to roam and explore.. Being a very curious ten year old, I always wondered what it would be like to climb up the side of the silo and look inside. In *the olden days* some silos didn't have tops on them. A younger cousin came to play with me on this week-end, and when milking time came we decided to climb the silo. After all, everyone was in the barn now, so who was going to stop us? WOW!, no one would ever know, or would they? We got to the top. I don't even remember looking inside. The next thing I knew I was sitting on the ground, facing away from the silo, with my back leaning up against it. I don't remember the fall or hitting the ground. Ah-hah!!!! Do you sense the entrance of an angel? My uncle told me much later in life that he had measured the distance of the fall shortly afterward and it was 32 ft. They also deduced that I had stepped into cow manure right before the fall, and my foot evidentially slipped off the ring around the silo. They found the evidence of the cow manure up 32 ft. on that silo ring and my uncle kidded me and said he knew a cow couldn't get up there, *SMILE*. Well, I do remember screaming "Help". The younger cousin must have gone to the barn to get help for the next thing I knew was they were trying to pick me up and me crying, "My leg fell off". It felt like there was no leg there. I was told later it was a compound fracture of my right hip. That is where the bone is broke totally in two and it protruded out the leg. I have to believe that God sent an *Angel* to catch me and gently place me on the ground. I remember having very little pain, as I feel sure that God allows us the comfort of *shock*, in times of trauma, to protect us. My parents moved again when I went into the hospital and I never saw them even once the whole time I was there. I can't remember crying but I do remember being told by the staff they had moved away. I never got mail from them either. I remember being so overjoyed at the kindness of the doctor and nurses and all the attention that they provided me with. Upon my release from the hospital, grandpa & grandma came to take me home with them. Grandpa made me a crutch out of a broom stick and carved the top from a piece of wood. Grandma wrapped the top part with rags for comfort. While I was living with my grandparents I remember seeing a plaque on the wall with the Bible verse John 3:16 on it and I wondered what it was all about . I asked grandma and she explained it to me. To this day, that has always been my favorite Bible verse. My fall from the silo happened in the springtime and I never saw my parents again till Halloween time. Now this story wasn't written so you could feel sorry for me! Not at all--it was written to say, yes God provides us with *Heavenly Angels*, you just have to believe. 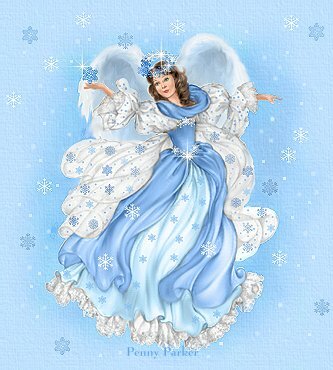 "Thank you", our Loving God for creating and loving us and for providing us with *Guardian Angels*, to look out for us.